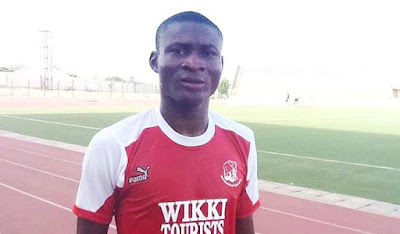 Nigerian striker Godwin Obaje's move to Tunisian club Etoile du Sahel may have hit the brick wall over contractual matters. The striker who was top striker in the Nigeria Professional Football League with 18 goals last season was said to have signed a three-and-a-half-year deal with the former African champions. But both clubs are however yet to agree on the final details of the contract which may now stall the move. Etoile are requesting for Obaje's International Transfer Certificate before paying the transfer fee. His Nigerian club Wikki Tourists are however unwilling to send the ITC insisting the money be paid before they send it. Another Tunisian club Club Africain are also looking to hijack the move if both parties fail to find a solution in time. Auwalu Jada, the team manager of the Bauchi Elephants, was not forthcoming when contacted on the matter. "I don't want talk about the issue of Obaje's transfer to Etoile du Sahel at the moment," he stated. "It's not ideal to do that for now. At the appropriate time, we will make an announcement on that." Two years ago, Obaje had a move to Slovakian club AS Trencin break down over contractual issues. He also recently failed trials at Russian club Spartak Moscow.